Your space is only as clean as the products and tools that you use. Microfiber cleaning cloths are gentle on your surfaces while achieving the best results. But like anything else—there’s microfiber, and then there’s microfiber! We’ve tested over 100 cloths to find the very best microfiber cleaning cloths. We’re proud to say our gold-standard cloths are ultra-thick and absorbent, which gives them a "squeaky-clean" reputation that we’re proud to put our name on. Our microfiber cleaning cloth kits include a full spectrum of our luxury microfiber cloths. This perfect all-purpose microfiber cloth suitable for almost every cleaning task in the home. These super absorbent microfiber cleaning cloths are our most popular product. 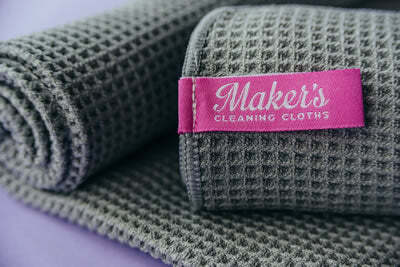 I am absolutely in love with my Maker's Clean microfiber cloths! I received the large space kit for Christmas and they are the best quality microfiber cloths I've ever had. These cloths actually make my life as a mom easier everyday! Thanks for making such a high quality microfiber cloth! The best microfiber cloths I’ve ever had! I love Maker’s microfiber cloths so much, I bought two large space kits. I have had many brands in the past but nothing compares. They pick up dust so well, the waffle cloths are amazing for drying dishes. The plush ones are so absorbent, love the flat weave cloths for streak free cleaning of technology, glasses and stainless.